One of the issues with 3D printing is the amount of waste that is generated when creating prototypes, mockups and testing your designs. One way to combat this is to break up your unwanted prints and extrude the pellets as new 3D printed filament. Protea Design based in Tokyo Japan has created a new home 3D filament extruder which is now available to back from just $600 with shipping expected to take place during December 2017. The DNA Extruder is ready to go in minutes. Equipped with a 600W internationally compatible power supply, DNA allows you to easily switch between 110V and 220V whenever the situation requires. What’s even better, there are no special plugs or cables needed to get the extruder going. We decided to make things as simple as possible by giving you the ability to use the same power cable you use for your PC. This allowed us to reduce costs and simplify everyone’s lives just a little more. DNA is a new and innovative filament extruder created by Protea Design. Meticulously engineered, DNA is aiming to bring a new meaning to dependable high-speed extrusion. Our goal was to create an extruder which has features and performance of a machine double its price. After nearly 3 years of development we were able to create something that is compact, fast, tough, lightweight, affordable and easy to use. 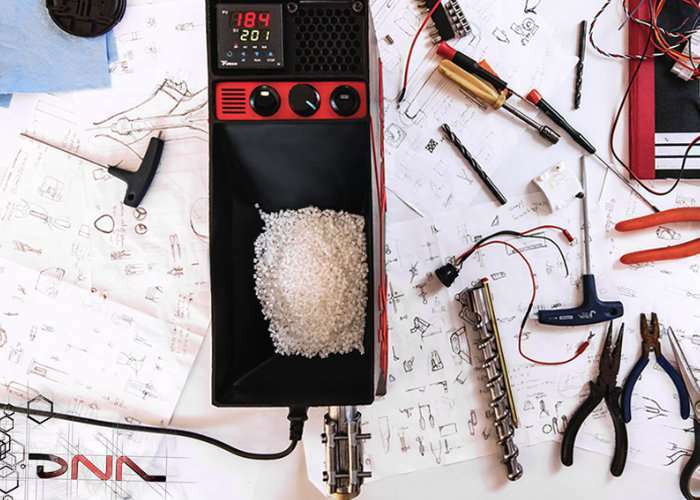 The DNA Extruder will be the last filament extruder you will ever want to own. Continuing with our focus on simplification, we made DNA very easy to operate. The temperature is adjustable up to 250C with the use of a digital PID temperature control unit. Speed is also user specified and can be adjusted with a simple twist of the wrist. There are separate switches for the extruder, the heatband and the motor. Jump over to the official Kickstarter campaign page via the link below for more details on the new 3D printing filament extruder.